Today I’m going to bring you a great post on why you should highlight your face! Highlighting your face makes your skin glow, it helps to minimize or maximize facial features and gives you that finished sheen you see in magazines. Today I’m going to teach you how to do it the right way here… and recommend the best Highlighters to use. Just because we are in Winter that doesn’t mean you can’t have that frosty glow you desire! 1) Open up your eyes. When you dot a tiny bit of highlighter to the inner corners of your eyes, it will instantly brighten up the whole eye area, make you look more awake and open up your eyes. 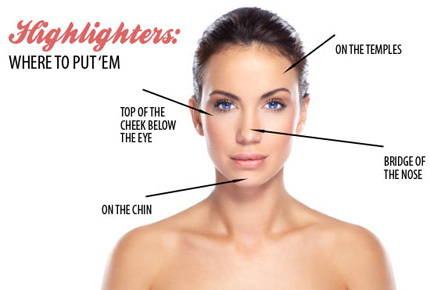 2) Highlighter will help you to look younger. To spice up your everyday look add a highlighter on top of your cheekbones. It will add dimension and create beautiful reflection, it only will be visible when you turn. This trick will help you to look younger and more fresh. 3) Make your forehead look polished. If you apply a little bit of highlighter on your forehead above your brows, this will also add dimension to your face and the skin on your forehead will look like it has been polished. (This is not recommended if you have oily skin or pimples on your forehead). 4) Smaller nose with the help of highlighter? If you would like to correct the shape of your nose, make it smaller or thinner, you don’t need plastic surgery. Apply a highlighter down the bridge of your nose and a matte color that is 1 or 2 shades darker than your skin tone on the sides of your nose, with this tip you can easily make your nose look thinner and smaller, but be careful when you use it during the day, remember to blend everything very well, so that nobody can spot any lines along your nose. All this should look smooth and well blended, just like natural shading of the face. Use a highlighter under your eyebrows and above them after you filled them in, this makeup trick will give you a visible lift, it will emphasize the shape of your brows, give them a clean look and accentuate your eyes. Pay attention and use the highlighter sparingly, no need to use a big brush. Use a tiny thin brush to get a more sophisticated result. 6) How to plump up your lips? You can easily do it with a highlighter – just dab it on your cupid’s bow (which is the middle of your upper lip) and onto the center of your lower lip (you can apply a highlighter on top of the lipstick or just on bare lips), this way your lips will appear larger and fuller. If you don’t have a highlighter, use any white shimmery eye-shadow instead, a shimmery lip gloss also will do. 7) Say no to dark circles around your eyes! Here is an easy and simple make up trick to quickly neutralize dark circles around your eyes: mix your creamy highlighter with an under eye concealer in propositions that you like and apply it (sparingly) under your eyes, this will lighten and brighten your eye area and will erase the signs of fatigue. Highlighting your face brings it to life, but you need to be careful where you put the highlighter as popping it in the wrong spots can both age you and give you that dreaded greasy skin look. Heavily blemished areas – it will just make them more obvious – shiny pimples? No thank you! A tiny bit in the center of the forehead. Why it’s great: This “perfect highlighter” is the one for you if want a “bronze-y glow”. It gives the perfect shimmer when you feel like you need a glowing yet natural look. Why it’s great: This Stila product Is so versatile. 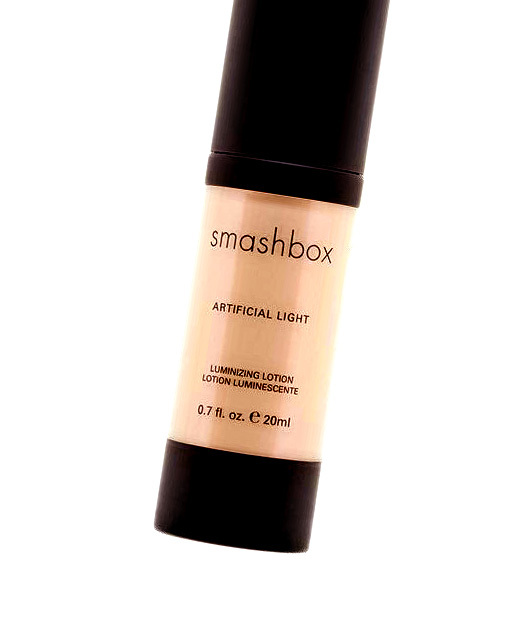 You can use this highlighter not only on your cheeks, but also you can mix it in with body lotion for an all-over glow. 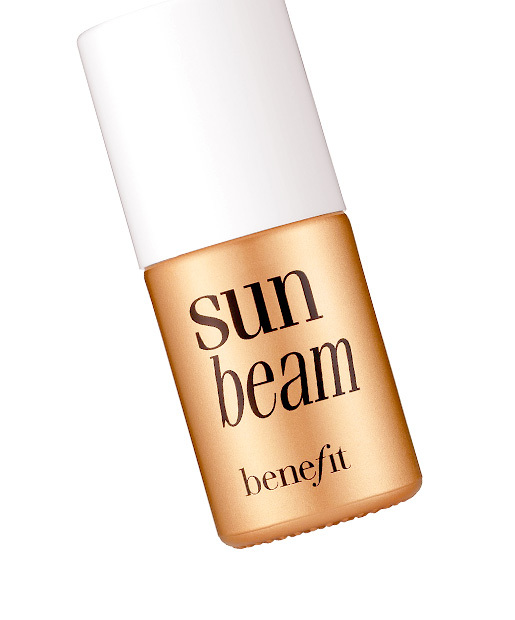 Why it’s great: If you want a picture-perfect glow, this is the highlighter for you. It shows up really well in pictures, but it looks even better in person. This is a great post! I just recently found my perfect highlighting and contouring routine and it works great for me! I am obsessed with the chiseled look you get when you highlight and contour! This post was a great read! Definitely made me click follow! definitely check out my blog if you wanna read about my favorite products and read my reviews and thoughts on different make up!